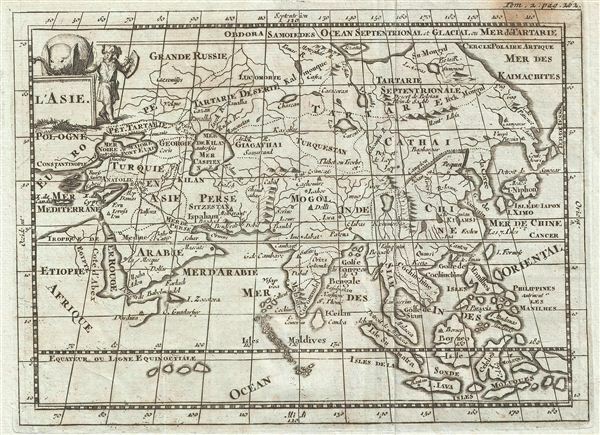 An uncommon and unusual map of Asia issued for Martineau du Plessis in 1700. This map covers the entire continent of Asia from the Mediterranean to Japan and from the Arctic to the Indian Ocean and the east Indies. The Great Wall of China is stylistically rendered. Numerous cities, most associated with the writings of Marco Polo and the exploits of Ghengis Khan, are identified. So too are numerous Silk Road capitals in Central and eastern Asia, including Beijing (Peking), Tashkent (Tanchit), Fergana, Samarkand (Samarchand), Lahore and Bukhara (Buccara). Also of interest is the misorientation of the Caspian Sea, here rendered as a bit of a blob, an error common to maps of the 16th and 17th though rarely the 18th century. These singular errors allow us to date the original composition of this map to the late 17th century, with possibly ascriptions to Kaerius, Du Val, or Cluver. This edition was prepared for Martineau du Plessis' Nouvelle Geographie, published in 1700. Very good. Original fold lines. Blank on Verso. Minor discoloraiton upper right.